If you’re looking to buy a new fridge freezer, Beko’s state-of-the-art American Style Fridge Freezers make a stylish addition to any kitchen. Unlike conventional fridge freezers, its doors open out in the middle, with the freezer compartment on the left, the fridge on the right. A big advantage of this is that you can place commonly used chilled and frozen foods at a convenient height level, making life much easier for busy households. Beko’s American Style Fridge Freezers are available in stainless steel, black, white, and silver and boast a modern streamlined design. What’s more, selected Beko models now come with a 2-year warranty covering parts and labour, so you can rest assured that you’re investing in a quality appliance. 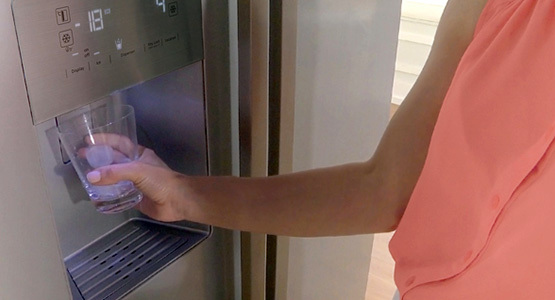 Several of Beko’s models come with either plumbed or non-plumbed ice and water dispensers and in-door icemakers, which are especially convenient in the summer or when you’re hosting dinner parties. The non-plumbed models are a hassle free solution in your kitchen, as there are no pipes to plumb in and no expensive filters to replace. Special Air Flow Cooling helps to maintain an even temperature from top to bottom using multiple vents and will quickly restore the temperature after the door has been opened. And with the Quick Cool and Fast Freeze features, your food will be rapidly chilled or frozen from the moment it’s placed inside and the door is shut, helping to maintain your food’s flavour and texture. They also have special technology to ensure your food stays as fresh as possible, such as Beko’s Neofrost Technology which uses two separate fans and evaporators to provide 2 x faster cooling and 2 x more humidity. This also means that there is no transfer of odours and the built-in carbon filter helps to eliminate any nasty odours. The chiller compartment is a low temperature fridge drawer which is ideal for storing meat and fish to keep it tasting great and fresher for longer. There is also an External LED Display, which allows you to easily adjust the temperature and set any of the special functions, all without having to open the doors. All Beko American Style Fridge-Freezers are EcoSmart, which means they have been verified by the Energy Saving Trust as being energy efficient – helping to save you money and benefitting the environment at the same time. 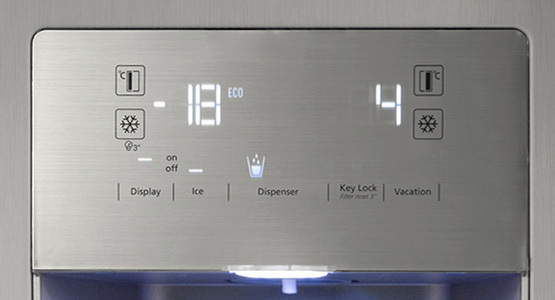 When you are away for a long period of time, the Holiday Mode on selected models will keep the fridge freezer running in the most energy efficient way, saving you time and energy. On every new appliance, you should find an Energy Label. This calculates its energy efficiency in terms of storage volume (in litres), frozen storage volume (in litres) and noise level (in decibels) and shows its energy efficiency grading. All household appliances receive an energy efficiency grading ranging from A+++ – G with A+++ being the most efficient. Beko’s American Style Fridge Freezers have a rating of A+ offering an energy saving of £110 over ten years when compared with conventional models. 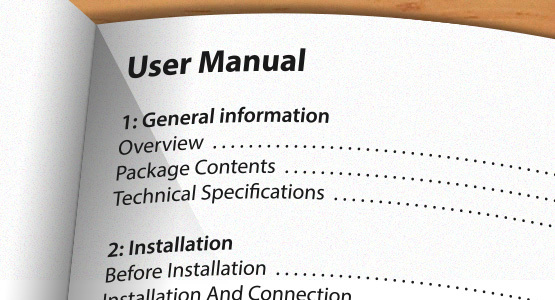 Consult your manual for comprehensive safety advice before installing and operating your machine. Never use an extension cable, always connect your model to an earthed socket. Keep raw meat and poultry below cooked food and dairy products, unless there is a specific drawer in your fridge for these kinds of food. Wrap raw meat and poultry loosely in polythene or aluminium foil. 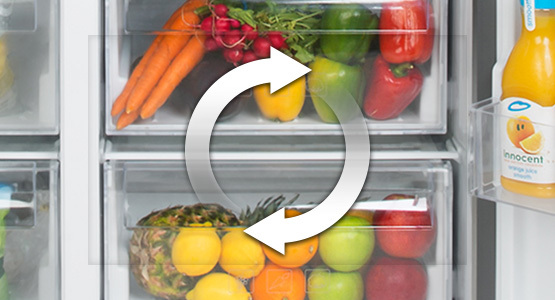 Avoid leaving the door open for long periods of time as this will make the refrigerator more costly to run. If food has been stored for an excessive time in the refrigerator it’s best to adhere to the ‘best before’ date and storage guidelines, and throw any putrid food away.